Why you should be using Thrive Themes for your Wordpress Website! In this post we’ll be telling you why we moved to Thrive Themes and never looked back! We spent months looking for the right solution. We needed the day to day running of the Tao website, along with our client websites, to be as easy as possible. Thrive Themes has helped transform the way Tao Digital Marketing does business. We’re always on the lookout for services and products that make us more efficient. Our Thrive Themes membership has enhanced our service offering, whilst simultaneously speeding up our workflow. Whenever a client asks us to help them with their Search Engine Optimisation and Paid Marketing campaigns we’ll always check if they’re using a CMS. If they are, is that CMS WordPress? It’s not that we won’t work with other Content Management Systems, however in our experience it provides us with a more stable base to work on. We know the system works and, importantly, understand how to maximise it to get the best results. WordPress, matched with Thrive Themes, brings the level of flexibility we need as an Agile Marketing agency. Let’s start with a quick review. We love Thrive here at Tao. The complete ease of use is one of the main attractions for the team. Setting up Landing pages is a doddle. With what feels like a click of a button you can have an optimised landing page designed and ready laid out for you. All you have to do is switch out the imagery and text. What used to take weeks to build, now takes a matter of hours. With the new Thrive Optimise plugin you can build A/B testing with just a couple of clicks too. We did have one small criticism with Thrive. It was to do with the level of customer service when they first released the Architect drag and drop page builder. However, we’re pleased to report, it’s become infinitely better. We normally receive a reply within 24 hours of logging a support ticket. The Thrive team are constantly striving to update and improve the platform too. This is great because you’re always getting the latest features and, generally, the updates released are stable and usable from the off. That said, the sheer volume of updates can sometimes prove tiresome and slightly annoying. For such a complete product though, it’s an annoyance we’re more than happy to put up with! In fact, one of the biggest updates that we’re eagerly awaiting is the launch of the new ‘Theme Builder’ theme. It will give the ability to change global areas such as the header and footer, blog post pages, etc. We use Generatepress right now for this type of ability but we’re very much looking forward to putting it through its paces. With the membership you get access to every product they offer. It can sometimes feel a little overwhelming and you might think it’s better to start with just one or two of the elements. We’d advise against this though. The full membership features such a powerful array of tools. We can honestly vouch for the fact that when you get using the Thrive product set you’ll definitely want more. Plus, added bonus, it works out far more cost effective than buying each product separately. The membership not only offers you access to all these excellent plugins. It also features unlimited updates and special access to some Thrive University courses that aren’t available to non-members. One of the major benefits of Thrive is the amount of pre-built, conversion optimised, landing pages that are available at the click of a button. Once you have Thrive Architect installed on your WordPress website, you can select from the vast library of page designs. The designs are not only for the landing page itself but also include all the pages for an entire lead generation funnel! This includes must-haves such as thank you pages, resource download pages etc. They also have a very keen eye on user experience metrics. One of our favourite features of the landing pages from Thrive is the ability to turn off all other CSS resource. This helpfully stops complex elements from loading when they’re not required. We all know the weighting Google now gives to faster pages. Well, as we wrote in our review of the drag and drop builder here we love it. It is the backbone of the rest of the Thrive Membership. 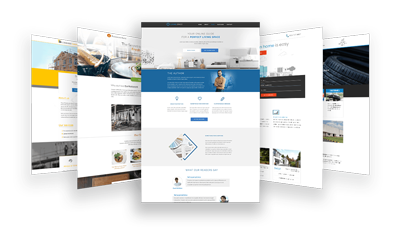 With Thrive Architect you can create pretty much any style of web page you like just by dragging and dropping elements onto a blank page. Recently added features such as the Contact Form element, pricing tables and the templates feature, mean it’s getting more and more to the point where you’ll need no other plugins on your WordPress site. Again, helping the speed of your page immensely. This is the plugin that started us off on our Thrive Themes journey. We’d been looking for an easier way to add pop-ups to the site and sign-up boxes, to our blog posts, as an example. Initially we thought it would have to be done manually on every article we wrote and published. Until we found Thrive leads. It’s so easy to get a new form set-up. You literally just have to select the design you want and then tweak it to your style and information. To some people, this could be perceived as a ‘gimmicky’ product. It was our initial thought. By carefully using Thrive Quiz Builder you can engage with your audience in a whole new way though. A fun way! Used properly, it can also be a sales asset. Want to offer a reward to people who completed your quiz and got over 90%? You can. A free pint, 20% off their next order, it could be anything depending on the industry you’re in. Thrive Quiz Builder can also give you a very interesting insight into your audience and can even be used to adapt how you market certain things to certain demographics. A well constructed quiz will also keep people on your site for longer, which will help with that all-important Google metric ‘bounce-rate’. Scarcity marketing is becoming huge. It’s a proven fact that ‘fear-of-loss’ drives conversions. With Thrive Ultimatum you can easily create scarcity marketing campaigns that are bespoke to each prospect who enters your site. With a variety of campaigns available at the click of a button, you can easily implement fixed-date, recurring, evergreen and multi-page campaigns to add urgency to almost any message. We’ve been using Thrive Ultimatum for a while now and with each update and all the new templates being released, it’s just getting better and better. Testimonials are super-important. It’s statistically proven that featuring a testimonial on a sales landing page helps conversions. Giving someone evidence that past clients have been left delighted will help you to close more deals. Do you always remember to ask for testimonials though? Or worse, do have to chase happy customers who are soon going to be unhappy customers because you keep chasing them for your testimonial? With Thrive Ovation, you can automate the way your testimonials are produced and how they’re added to your website. This is a nice plugin that lets you better target what people are clicking on when they’re on your website. By adding this plugin to specific widgets on your site you can give user different experiences based on what their interactions with your pages have been. For example, if someone has read a certain blog post, you can give them easy access to other content that they might be interested in. Whilst nowhere near as in-depth a tool as something like Thrive Leads, Clever Widgets is certainly a welcome addition and we’ve had lots of fun experimenting with it. Great headlines get clicks. Without clicks your content doesn’t get read. No matter how good the body content is. In fact, did you know five times as many people read article headlines compared to those who actually read the body text? Staggering! Here at Tao Digital we love Thrive’s Headline Optimiser plugin. In simple terms, it’s a plugin that allows you to test multiple headlines for every post you put out there. The plugin does the hard work and figures out, statistically, which headlines get the clicks and which ones don’t. With built-in A/B testing and detailed reports which tell you crucial information such as click-through rates, scroll rates and the time people are spending on your content, Headline Optimiser can be used to great effect; helping you get the most out of your content output. It also works really well with Woocommerce. You can use Headline Optimiser to ensure the titles of your products are getting the maximum user engagement to help your online store make more money. This is a fairly new addition to the Thrive Themes membership. Apprentice allows you to easily create online courses and manage how the content is displayed to your members. It allows you to create different structures including things such as products, chapters, modules and lessons which means you can create different levels within your lesson structure. It’s a great tool for delivering online lessons and with features such as ‘welcome back’ shortcode which lets users pick up where they left off and easy to use navigation widgets, it will help you to offer your course members a great user experience too. What do visitors get in return when they comment on your post? A reply, if they’re lucky? If you’re left wondering why your posts are getting low levels of engagement, the chances are it’ll be because you aren’t offering potential commenters enough reason to leave their thoughts and feedback. Thrive Comments is designed to help you build more interaction with your posts. It gives you the ability to offer your commenters social validation in the form of likes, featured comments, badges, social media sharing and much more. Using Thrive Comments gives people more reason to engage with your posts which naturally helps grow interaction and popularity. We also really like the fact you can automate parts of the engagement process. For example, when somebody comments, you can assign what happens next. You could set Thrive Comments to display a custom message, redirect to a URL, ask for a social share or even display a Thrive Leads lightbox. It’s a great tool and we wouldn’t want to be without it! GDPR as been the buzz acronym of the past twelve months or so. With so much of a Thrive Themes membership being geared towards user interaction and lead generation, it’s something the Thrive team have clearly spent a lot of time thinking about and getting right. Each of the products is heavily geared to towards full GDPR compliance. For example Thrive Leads features checkboxes for explicit consent, Thrive Quiz Builder allows for people to anonymise their data and all products featured in the membership allow for the elimination and encryption of personally identifiable information stored in cookies. This level of thought and detail helps to take a lot of the stress out of building detailed user profiles and fully compliant lists of leads and prospects. As you can probably tell, we love using Thrive Themes here at at Tao. We wouldn’t be without our membership. By learning how to use the different plugins properly, we’ve been able to make our own processes more efficient, whilst also improving tangible results and outputs for our clients.